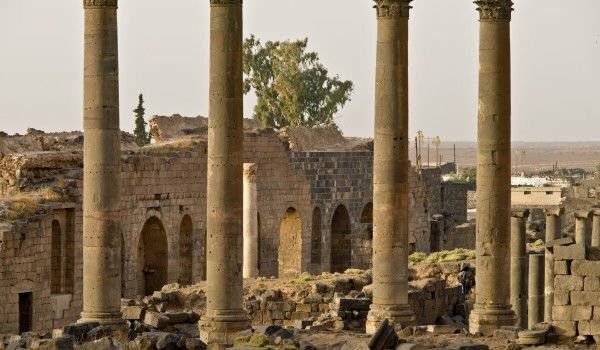 Bosra is voted as the most "Roman city" in Syria. Bosra is a famous, mostly well-preserved Roman, ancient theater, which is part of World Cultural Heritage sites by UNESCO. Bosra is now heir to the ancient city, located in the southern part of the country, near Daraa Governorate. Located 108 km south of Damascus, in Bosra we can see monuments from the Byzantines and the management of the Caliphate, which along with the Roman Theater makes it one of the main tourist attractions in Syria. Bosra was once capital of the Roman province of Arab territory and over the centuries an important stop for passing trade caravans on their way to Mecca. Bosra is mentioned in documents of Tutmose III, Akhenaton and early 14th century BC. In the 2nd century BC, Bosra became the first city of the ancient Semitic Nabatean people, which inhabited areas of southern Jordan, Canaan and the northern part of Arabia. Roman Emperor Trajan is the one who turns Bosra into the capital of the Roman province of Arabia. At that time the fortress Bosra was extremely powerful and serves as a key post east of the Jordan River. Originally the city was of Roman Emperor Philip, under whose management Bosra reached the status of city. Only when the Roman Emperor Severus, however, did the importance and size of Bosra increase. As big and important center of the empire, Bosra was built on the model of all other capitals - all indicators are constructed of luxury - thermal baths, houses and colonnades. Around the 2nd century AD, Bosra became the second most important city in Roman Syria after Damascus, the main city, a commercial crossroad and cultural center. Today, Bosra is a popular tourist destination among the admirers of cultural and historical sights, mainly because of the well-preserved Roman amphitheater. It is considered one of the best preserved in the whole world, and is still actively used. Thanks to its excellent acoustics, the Roman theater in Bosra is a place for guest-musicians and conductors from around the world. It is assumed that the amphitheater in Bosra was built around the late 2nd century. Literally translated, its name means "fortress". Extremely interesting for its architecture, the amphitheater is reminiscent of a fortress citadel but with thick, descending into the ground foundation. Because of this, the theater can be used as a reservoir during a siege or drought. Before the scene of this ancient landmark of Bosra, this was an empty space which is supposed to be filled with water and made incredible acoustics for the theater. Roman theater has a capacity of 15, 000 people, with 37 seating lines. The length of the theater is 100 meters, which together with its capacity makes it one of the largest outdoor theaters in the world that are still functional. Bosra Roman theater even has catacombs, which can accommodate thousands of people. This is due to the fact that the long structure was used as a military asylum and a place for entertainment. During the medieval ages, the Roman amphitheater building was protected by another fence wall, which is probably one of the main reasons why it has been preserved in excellent condition. In Bosra there are many historical ruins and monuments. The best preserved of these is the stone building of the basilica. This temple was built in Bosra in the 3rd century and a little later became bosom of the missionary activity of monks who came to the Arab lands to convert people. Bosra Cathedral is one of the first really large churches. Today only ruins remain of it. It had a huge dome and served as a model of the Rock in Jerusalem and the smaller Hagia Sophia in Istanbul. Among other historical ruins in Bosra, there are those of the Roman baths, hot springs, the port, market and several mosques.